The Gambia has said it is cutting all ties with Iran and ordered all Iranian government representatives to leave within 48 hours. Officials from the small West African nation gave no reason for the move. But last month Nigeria said it had intercepted an illegal arms shipment in Lagos from Iran, destined for The Gambia. Senior Iranian official Alaeddin Borujerdi has said the move was taken under US pressure. The Nigerian authorities said they had discovered the weapons, including rocket launchers and grenades, in containers labelled as building materials. The France-based shipping company CMA CGM which transported the shipment said attempts were made to send it to The Gambia before the Nigerian police seized it. Mr Borujerdi, chairman of the National Security and Foreign Policy Committee of Iran's parliament, confirmed that a private Iranian company had sent the arms to The Gambia but said this was "in line with international laws", reports the official Islamic Republic News Agency (Irna). Rana Rahimpour from the BBC's Persian Service says the breaking of ties does seem to have taken Iran by surprise and officials appear to be playing it down. She says Mr Borujerdi's comments are the first from an Iranian official to confirm that the arms were destined for The Gambia. Nigeria has reported the seizure to the UN Security Council. Iran is under UN sanctions because of its nuclear programme and is banned from supplying, selling or transferring arms. "All government of The Gambia projects and programmes, which were [being] implemented in co-operation with the government of the Islamic Republic of Iran, have been cancelled," the Gambian foreign ministry said in a statement. Correspondents say ties between Tehran and Banjul - which have both faced criticism over their human rights records - became closer after Gambia's President Yahya Jammeh came to power in 1994. 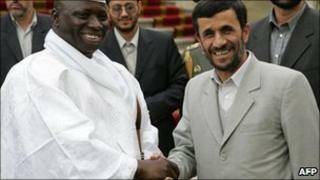 When The Gambia hosted the African Union summit in 2006, Iranian leader Mahmoud Ahmadinejad was a guest of honour. The Gambia has been among those developing nations who have defended Iran's right to nuclear power. Charlie Zrom, who has published a paper on Iranian foreign policy for the American Enterprise Institute, a think-tank in Washington, says the move will be an embarrassment for Iran. "Iran has sought partners around the world especially as sanctions have come on the table in the last few years," he told the BBC's Network Africa programme. "West Africa has been a key priority for them and we've seen a number of visits both from President Mahmoud Ahmadinejad and from the defence minister. "It's a tool by which Iran tries to prevent measures harmful to it, or it believes harmful to it, being passed at the United Nations." Correspondents say the decision to expel all Iranian diplomats will bring an end to several projects funded by Iran, such as the $2bn (£1.2bn) agreement to supply The Gambia with heavy and commercial vehicles.